Dove snails are well known for their bold and often complex shell colouration. The animals are mostly carnivorous, but some species have secondarily become herbivorous. The Fox Dove Snail prefers high energy rocky shore habitats such as wave-exposed rock platforms, and is often found as beached shells. 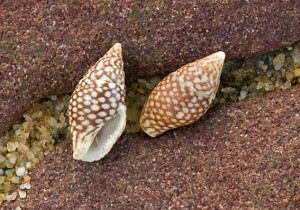 The shell of this species (up to 20mm) sometimes shows marked variation in colour pattern, and hence a number of unnecessary scientific names for it have been proposed over the years.